When Hurricane Harvey hit Texas last week, people in Houston, America’s 4th largest city, braced for the worst. Harvey was huge. The US National Weather Service warned: “This event is unprecedented and all impacts are unknown and beyond anything experienced.” Since then we’ve seen rainfall that has broken all records. Harvey is now the most extreme rain event in US history. Though the extent is unknown, there’s an obvious connection between the extreme nature of Harvey and climate change. Warmer air and water coupled with rising sea levels makes hurricanes more powerful and dangerous. In 2015, then Houston Mayor Annise Parker warned that sea-level rise would significantly increase the cost of damages from floods. Speaking to the Boston Herald, climate scientist Juliette Rooney-Varga, described the climate signal: "As the ocean warms, it can transfer energy through the storm. The warmer the atmosphere is, the more moisture it can absorb from the ocean. We are hearing the terms ‘record-setting rainfall’ or ‘intense precipitation’ more and more across the country — not just in this storm." But the problem isn’t just souped-up storms, it’s how we manage the urban environment. 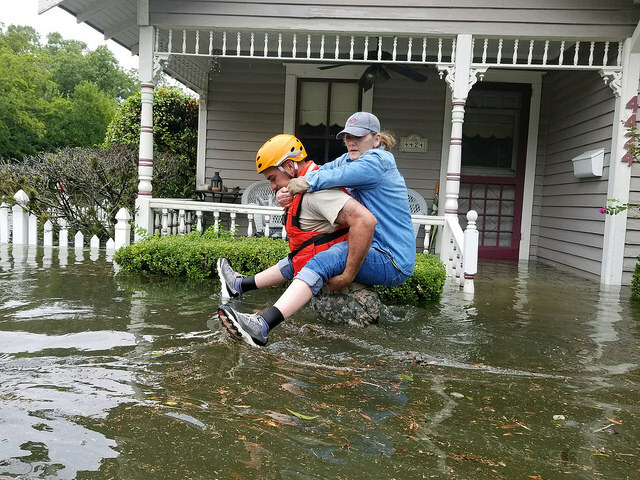 You don’t have to look far to find people who have been warning about how Houston’s relaxed approach to urban planning and tolerance for urban sprawl has increased flood risks. As the flood waters recede, the damage is likely to be immense. Businesses, homes and car-owners with insurance will likely make claims for up to US$20 billion (132 billion yuan) according to JPMorgan. But RMS, a global risk modelling firm, estimate that total economic losses caused by wind damage, storm surges, and inland flooding from Hurricane Harvey could be as high as US$70-90 billion (462-594 billion yuan). Why the difference? The reason is because very few people have flood insurance. As of August 2016, just 15% of the 1.6 million homes in Harris county, which includes Houston, had flood insurance, and just 28% of homes in “high-risk” areas for flooding. Those without insurance will likely rely on the National Flood Insurance Program (NFIP), a government effort that was supposed to supply affordable flood insurance coverage in exchange for local government action to reduce risks. Unfortunately, it hasn’t turned out that way. The programme is currently US$24.6 billion (162 billion yuan) in debt. But more worryingly, the programme is seen as incentivising rebuilding in areas that have already been hit by catastrophes. These “repetitive loss” properties account for only 1% of all the properties insured, but make up 20-30% of all the claims. Of 30,000 repetitive-loss properties examined by the Natural Resources Defence Council, 75% had done nothing to mitigate future risks. Reforming the programme has brought together some unlikely bedfellows. Private insurers, environmental groups and both Republican and Democrat politicians are demanding the programme be reformed. These groups agree that more accurate flood maps, incentives for reducing risk and private sector competition are needed. But effective reforms will have to raise the cost of insurance for people who live in flood-prone areas. And this is a bitter pill to swallow for homeowners and the politicians who represent them. Key reforms that would have raised premiums for many NFIP policyholders, passed in 2012, were quickly repealed in 2014. The deadline for reauthorisation of the programme is later this month, and the scale of the losses from Harvey will bring new urgency to the debate. Whatever happens, urgent reform of the way the US prepares and pays for floods is needed. Yet there are worrying signs that the Trump administration may actually be making things worse. An executive order issued shortly before Harvey rolled back flood-risk standards for government funded infrastructure projects built in areas prone to flooding or subject to the effects of sea-level rise. Scott Pruitt, who runs the Environmental Protection Administration and is an influential member of the Trump administration, did not give a clear answer when questioned about the link between Harvey and climate change. The Trump administration has been undoing or undermining efforts to mitigate and adapt to climate change, going as far as removing mention or explanation of the phenomenon from some government websites. It’s hard to plan for something you won’t acknowledge is happening. With seas rising and skies warming, Houston will need to build back smarter if it’s going to avoid even greater future losses. But the city is also home to much of the country’s oil and gas industry, which produces the greenhouse gas emissions that drive climate change. The changes needed in Houston therefore go beyond better urban planning. The city that is known for fossil fuels needs to embrace clean energy. There are positive signs – Texas is already the nation’s largest producer of wind energy. The damage wrought by Harvey has been devastating. But at a time of increasing political fractiousness, the response to the storm by ordinary people has been resolute, unified and often ingenious. That same spirit will be needed to cope with the challenges ahead.